← Core Employee Needs: Not All or Nothing! June is National Employee Wellness Month, so let’s focus on some current workplace health and wellness stats. We know that a workplace culture based on Trust creates happier, engaged and higher preforming employees on all levels. And health and well-being should be considered an important factor towards this overall goal because employees who experience poor health and wellness are likely to (amongst other things) experience higher levels of stress, miss more days of work and experience less productivity – all important determinants in an employee’s overall engagement. With Employee Wellness Month in mind, let’s celebrate the health and wellness of those around us, and consider the wellness initiatives at our own organizations – are there programs in place? Do they work? Do employees know about them? In “The 2014 Consumer Health Mindset Study” Aon Hewitt has partnered with The National Business Group on Health (The Business Group) and The Futures Company to explore the “perspectives, attitudes and behaviors that employees and dependents hold toward health and health care as they interact with their employer-sponsored health plans and wellness programs”. When it came to respondents’ perceptions of personal health, there were some interesting takeaways, including that overall, from 2012-2013, the amount of people reporting that their “health is at least good” has slightly increased (from 87% in 2012 to 92% in 2013). However, respondents continue to fail to consider their weight when accounting for their overall health; with 59% of those reporting being in “at least good health” considered medically to be overweight or obese, up from 53%. As far as actions that lead to good health, respondents ranked the most influential factor as “making smart healthy choices in my daily life”, which ranked over factors such as “getting regular preventive care,” “living and or/working in a healthy environment,” “having good genes,” and “having enough money to pay for all the care I need to stay healthy.” Those employees who do work in strong cultures of wellness, however, were more likely to say that they had control over their health. Additionally, related to culture at work, respondents ranked “work environment” as the 3rd biggest obstacle that kept them from getting and staying healthy (lack of time at 63%, affordability at 40%, work environment at 35%). When looking at health care costs over the last decade it comes as no surprise that affordability ranks amongst the biggest concerns for maintaining health – employees’ share of health care costs will have increased 125% from 2004 ($2,011) to 2013 ($4,542). Interestingly, only 12% of respondents see health information from their employer as significantly influencing their actions (but this number is up 50% from 2012). This is interesting considering that we have seen a significant increase of companies instituting health and wellness programs as a whole; are these programs in place but just not being used? 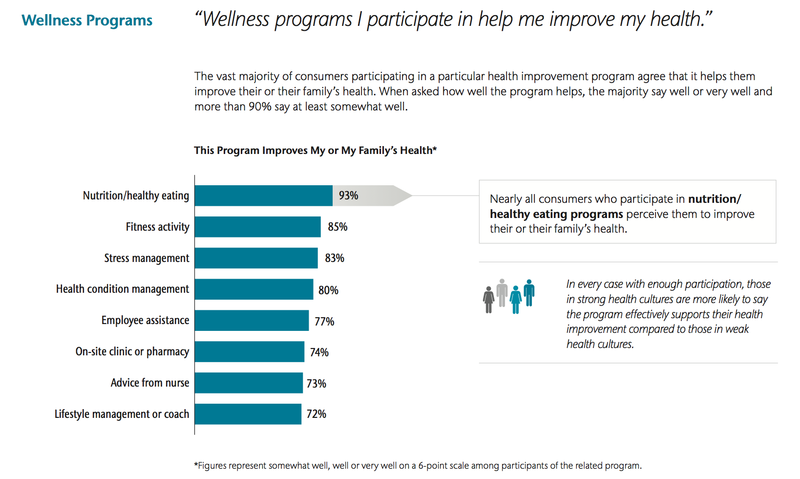 Are employees not interested in the types of wellness programs being offered? Aon Hewitt’s study states that 19% of respondents feel their employers encourage healthy behavior between a 0-3 range (on a 10 point scale), whereas 47% believe their employers encouragement of healthy behavior falls between a 4-7 point ranges. Given this, it seems less likely that companies don’t have any programs in place at all, and more likely that they are either programs employees aren’t interested in, or aren’t aware of. So how can companies encourage employees to take advantage of health and wellness programs? Respondents indicated that two of the biggest influencers of feeling like their organization had a strong health-related culture were: that their employer seriously considers all actions that improve employee health, and that employees were actively encouraged to incorporate healthy activities during the work day. Additionally, employees want programs that they can personally relate to. 46% of respondents stated they would not participate in a wellness program that is not relevant to them or does not apply to their situation (the number one reason). Additionally, in terms of what makes wellness programs most appealing, financial rewards (even small sums like $50 or less) takes the top spot, followed by programs being easy to do or convenient. Lastly, remember that respondents perceive making independent “smart healthy choices in my daily life,” to be the biggest overall influencer on their health and wellness. With this in mind, perhaps the most successful workplace wellness programs are the simple things put in place to encourage employees to make these choices – sometimes it’s the little things. Happy National Employee Wellness Month!